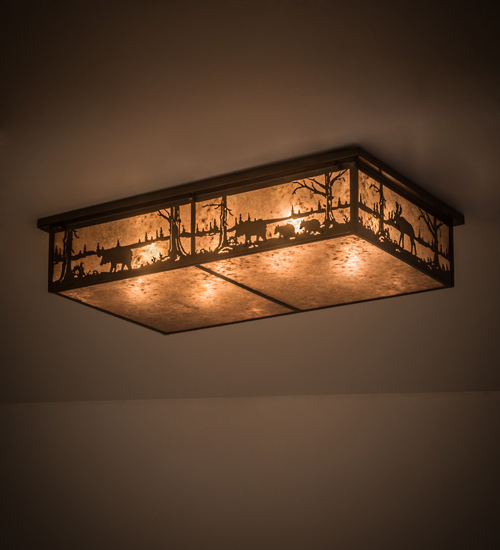 Description: A majestic Moose and a Bear with her Cubs meander alongside a mountain lake as the late afternoon sun casts a golden glow, creating a picture postcard image for this charming ceiling fixture. Eye-catching Silver Mica is featured on the lens as the decorative accents and hardware are offered in an Antique Copper finish. This oblong fixture is custom crafted by highly skilled artisans at the foothills of the spectacular Adirondack Mountains in Upstate New York. Custom sizes, styles and colors are available, as well as dimmable, energy efficient lamping options. The 35-inch long flushmount is UL and cUL listed for dry and damp locations.